See our 3 Mile Lodge Virtual Tour. *Information regarding amenities, accessibility and application are listed at the bottom of the page. An intriguing waterfront vacation property located 3 miles from Nelson City on pristine Kootenay Lake in south central British Columbia, Canada. It is a majestic log post and beam structure that can accommodate a large number of guests. The open floor plan and sweeping sliding windows open up to a massive deck and a stunning panoramic views up and down the lake, the mountains and forest of the opposite shore and an assortment of wildlife calling the lake home. In winter, a short 30 min drive brings you to Whitewater Ski Resort, one of the finest powder ski venues anywhere. It attracts powder hounds, boarders, free skiers and cross country enthusiasts from all over the world from November to March, along with another highly rated resort, Red Mountain, about a 1 hour and 30 minutes to the south. 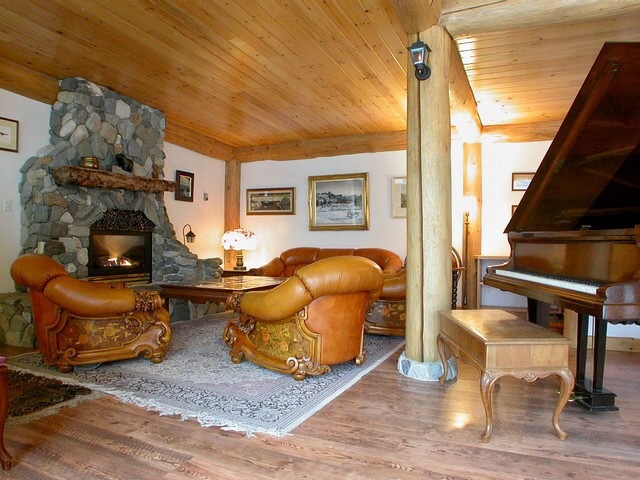 With two fireplaces in the dining/living room the lodge is a cozy home to return to after a serious day of outdoor recreation. In season, the Nelson Maple Leafs Jr. Hockey Team plays at the new Civic Arena, a good locale to meet Nelsonites at leisure. Kootenay Lake is a 1 minute walk from the property. The fine sand beach gradient is gradual for a long distance. There is a private moorage with float anchor. 3 Mile Lodge offers countless unique features such as stain-glass windows and furniture, many custom designed artisan pieces, and rock-stone detailing both on the interior and exterior of the lodge. Multiple sliding doors allow the viewers to enter the deck area. Click here to access the Rental Application for Three Mile Lodge: RentalApplicationThreeMileLodge.